Une rumeur circule parmi les enfants des écoles en Suisse. Elle dit que le chiffre à la fin du numéro de la carte d'identité indique le nombre de sosies. Et celà serait utile pour les caméras de surveillance et leurs logiciels de reconnaissance faciale. Cependant, la sociologie et la psychologie enfantine étant des domaines bien trop complexes pour moi, j'ai juste voulu savoir ce qu'étaient réellement ces chiffres. Sûrement des chiffres de contrôle, qui apparaissent à la fin de tous les codes qui doivent pouvoir être lus par des machines, comme le nos des comptes bancaires, des cartes de crédit, etc. 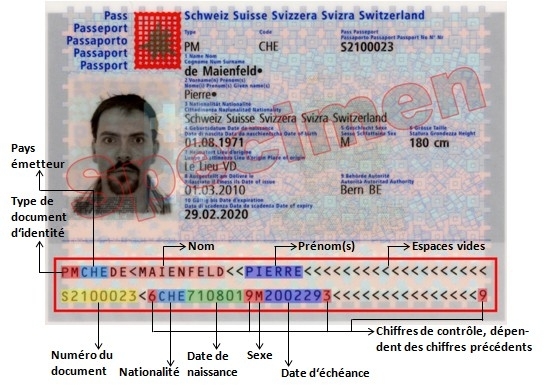 La signification des chiffres est vaguement expliquée sur le site de la Confédération pour les passeports, mais pas pour les cartes d'identité. Quand à l'agorithme utilisé pour le calcul du chiffre de contrôle, il n'est mentionné nulle part. 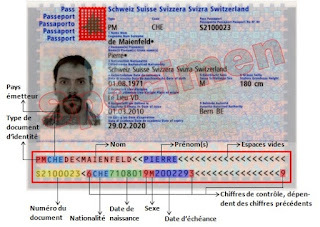 De plus, sur l'exemple qui illustre les chiffres pour le passeport, le chiffre de contrôle est FAUX! L'exemple indique "9" en bas à droite au lieu de "6"! Avec une telle avarice d'explications de la part des autorités, il n'est pas étonnant de voir surgir des rumeurs bizarres. Heureusement, pour la carte d'identité, il y a une page en allemand de Wikipedia qui explique le tout, y compris l'algorithme utilisé pour les chiffres de contrôle. Ainsi, après mon exploration ancienne du calcul "modulo 10" pour certains chiffres de contrôle de banques et autres, j'ai pu m'amuser à faire un petit script qui donne le nombre de sosies les chiffres de contrôle pour les cartes d'identité et les passeports suisses. $num =~ s/[^A-Z0-9<]//g; # and remove spaces etc. Et pour les geeks, le script complet est ici. What most normal users need to know about hard disk partitions and filesystems to be able to move hard disks between various operating systems like Mac or Windows. Hard disks contain 1 or more partitions. To the user, each partition appears as if it were a separate hard disk. MBR or DOS : supported everywhere, but only for disks up to 2 TB. GPT or GUID : for disks over 2 TB and for Mac OS X boot disks. There are many different types of file systems. Your system needs to understand these file systems to be able to use them. Unfortunately, various operating systems use different file systems. The problem is to find which one will be understood by all the systems you intend to connect your drive to. Also, some systems only support reading some file systems, not writing to them. Below is a table trying to summarize the compatibility between the 3 main operating systems and the 5 main file system types. There are many others, but if you know about them, you probably don't need this page. NTFS Native support Read only. Write support through additional software 1 Read/Write on recent distributions. The Windows disk manager refuses to format a FAT32 partition greater than 32 GB. But it can be formatted to the wanted size on Mac or Linux, or with the free fat32format utilityin Windows. HFS aka. "Mac OS X" HFS+ aka. "Mac OS X Extended (journaled)"
Meant to replace FAT32 on digital cameras etc. Supports files greater than 4GB, but not as feature-rich and reliable as the others. Is the official standard for DCP disks and the most common file system on Linux. You could try some Windows or Mac driver, but it's probably much easier to install Linux on some old machine and access it through the network. And what about UDF, the "Universal Disk Format" which is even a true ISO standard? It is used on professional camera cards and on Blu-ray disks, and can in theory be read and written by all 3 current systems. But in practice, this is only true if it is correctly formatted. And since the normal formatting tools in Mac and Windows don't offer it as an option, I would only recommend it to geeks willing to use this command-line formatting script. 1. Mac -> NTFS: To enable writing of NTFS on a Mac, you need a commercial program like Paragon or Tuxera. 2. Windows -> HFS: If you only need to copy files from a Mac disk to your Windows machine, you can use the free HFSExplorer, which will open your drive in a Windows Explorer-like window and let you copy files from there. For full support, you may need commercial software like MacDrive or Paragon. 3. Linux -> HFS: If you need to write to the HFS disk, journaling must be disabled on a Mac first (through Disk Utility or diskutil disableJournal "/Volumes/YOUR_VOLUME_NAME"in Terminal). Alternatively, you can force the mount point to be writable. 4. Windows/Mac -> ext2/3/4: There are various free drivers for Windows and Mac, but when I tried them a few years ago, they were probematic. There is also a commercial driver from Paragon which I haven't tried. But really, a Linux machine on the network is so much easier. Since Firefox was upgraded to version 43 on my Ubuntu 12.04 LTS machine, it "reliably" crashed on some pages. The easiest example being youtube.com, but many other pages also. After trying many things which didn't work (disabling all extensions, all plugins, creating a fresh new profile), I decided to downgrade Firefox to the previous version. But the previous version is hard to find! Roundcube is not available through apt-get in Debian 8 (Jessie), and the version which is in Debian 7 (Wheezy) is outdated. However, installing directly from the source is very easy. I used SQLite, because these servers will only occasionally serve a few users for single domains. So a full database server seemed overkill. I selected /opt/roundcube as my install dir. Check the latest version on the "Roundcube Webmail Downloads". As of November 2015, the version was 1.1.3. Copy the link for the "Complete" download. Uncompress, copy out of the version-specific folder, and rename the original folder in case you need it. You will be left at the sqlite prompt. Type ".quit". Edit the Roundcube config file. $config['mail_domain'] = '%d'; # let new users get the right domain instead of the default "user@localhost"
If needed, see also the Roundcube Wiki. The following briefly appeared in a Qnap forum, but was apparently quickly removed. What this also shows is that the NAS http server appears to be running as root, since the /etc/shadow file should only be readable by root! this shows the id of the web server process as "admin", with UID 0 and GID 0. So it's really running as root, which is certainly very helpful for NAS-hackers. I needed to replace a drive in a Mac mini with a bigger one. The drive had Mac OS X 10.9 (Mavericks) and Bootcamp with Windows 7. After using Clonezilla to backup the drive and restore it to the bigger one, the partitions were obviously still the same size. There was just a lot of free unpartitioned space at the end of the new drive. How to resize and move all the partitions (including the hidden EFI and Recovery partitions), to fill the free space? Disk Utility will not let you touch the Bootcamp partition. Windows 7 looked like it could resize it, but not move it. Resizing it with Win7 created a mess: the Mac would still see the original size. The heart of the problem seems to be that the Mac wants a GPT partition table, but for Bootcamp, it creates a hybrid MBR partition which is what Win7 sees. Win7 would have no problem with a GPT-only partition, but Bootcamp makes a hybrid MBR anyway. Win7 then resizes that MBR partition, but doesn't update the GPT partition table, which is what the Mac sees. And the Mac doesn't let you fix it either. At this point, I tried Gparted, but it wouldn't touch this mess (giving some error which I forgot). Paragon's Camptune X looked like the best solution. However, after paying $20 for it, it turned out it couldn't do anything either. All it does is to let you move a cursor for the relative sizes of the Mac and Windows partitions. But you cannot increase the size to use the free space. Finally, Rod Smith's Gdisk saved the day again. Booted a Gparted USB key, and resized the Windows partition to fill the entire disk. Booted to Mac, and used Camptune X to enlarge the Mac partition while reducing the Windows one. Now, Windows would not boot. Used gdisk to re-create the hybrid MBR, and mark the Windows partition as bootable, as explained in detail in this post. Burning-in timecode is easy in Avid or Final Cut, but if for any reason you need to do it the hard way with command-line ffmpeg, here is how. "AVFilterGraph ...] No such filter: 'drawtext'". the version 2.0.1 built by Helmut Tessarek worked fine. Unfortunately, it is compressed with 7-zip, so you may need to get a decompressor first. I used Keka (not open source, but free). Below is the command I used to quickly encode Sony mpeg2 MXF files into H264 Quicktimes, preserving the original timecode in the QT TC track (ffmpeg does this automatically), and also burning it into the picture. # the timecode rate must be set. Should be identical to the FPS. # For bottom right, try this instead: position="x=(w-tw)/2: y=h-(2*lh)"
ffmpeg -threads 0 -i "$in" $test_secs -acodec copy -vcodec libx264 -preset $preset -crf $crf -deinterlace -vf "drawtext=fontfile=$font: timecode='$tc_escaped': r=$tc_rate: $position: fontcolor=white: fontsize=$fontsize: box=1: boxcolor=black@0.2" "$out"
ffmpeg -threads 0 -i "$in" $test_secs -map 0:0 -map 0:1 -acodec copy -vcodec libx264 -preset $preset -crf $crf -deinterlace -vf "drawtext=fontfile=$font: timecode='$tc_escaped': r=$tc_rate: $position: fontcolor=white: fontsize=$fontsize: box=1: boxcolor=black@0.2" "$out"
Event ID 1511: Windows cannot find the local profile and is logging you on with a temporary profile. Changes you make to this profile will be lost when you log off. Event ID 1521: Windows cannot locate the server copy of your roaming profile and is attempting to log you on with your local profile. Changes to the profile will not be copied to the server when you log off. This error may be caused by network problems or insufficient security rights. This seems to happen when a machine on the network thinks it is the domain master browser and convinces the real PDC of it. I have seen it happen with a Mac (10.6.8), and with a new NAS. They were both running Samba (just like the actual PDC which is a Debian Samba server). Maybe "os level = 1" is exaggerated, but I used that anyway. The "local master = no" setting doesn't get activated on the Mac (testparm -sv | grep master still shows it set to Yes), but it works anyway now. To check the master browser from Linux or Mac: nmblookup -M YOURDOMAIN or nmblookup -M -- - for all, which may show others which are not in the same domain/workgroup. "Attempting to connect to database "postgres" as superuser "postgres"... error: No database connection"
The server is still using Debian Squeeze, but I expect it would quite the same for the new Debian Wheezy. Here I used squeeze-backports. #        AuthName "Example Wiki. Requires user name and password"
Before starting the web configurator in http://wiki.example.lan/config/ you need to define a password for the "postgres" database user. Mediawiki will start the psql client as the www-data system user, but with the -U argument to set the user to "postgres". Even if you defined a password for the system user "postgres", this is not the password of the database user "postgres". And a big pink and unhelpful error box below. FATAL: password authentication failed for user "postgres"
Now you just have to move LocalSettings.php to /etc/mediawiki/.